BSE Sensex fell as US shutdown deadline neared; Kumar Mangalam Birla's Hindalco up despite CBI raid. The BSE Sensex fell 60 points today,the first drop in six days,led by financial stocks after weak inflation data indicated the RBI would raise interest rates. HDFC Bank,ICICI Bank,HDFC Ltd and State Bank of India (SBI) dragged the BSE Sensex lower after WPI inflation for September came in at a seven-month high of 6.46 per cent. The major index losers included Hero MotoCorp and Tata Power – Kumar Mangalam Birla’s Hindalco Industries up despite CBI raids and corruption charge. 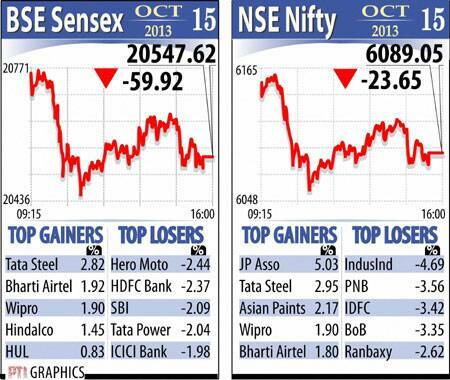 Nine of the 13 sectoral indices fell,led by bank,realty and consumer goods stocks. Hindalco Industries Ltd gained 1.45 per cent,recovering from initial losses. The CBI lodged a case against Chairman Kumar Mangalam Birla and others in connection with the allocation of coal blocks eight years ago. The S&P BSE Sensex resumed higher at 20,722.90 and moved up to 20,759.58,the highest intra-day level since November 11,2010,on the back of higher global cues,continuing capital inflows and expectations of good corporate results. 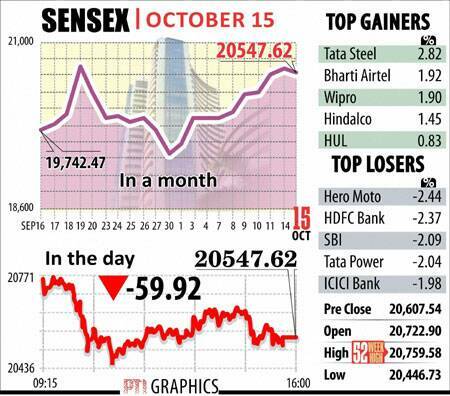 The index,however,failed to sustain the gains and ended at 20,547.62,a loss of 59.92 points or 0.29 per cent. It had gained 712 points in the previous five trading sessions. The NSE Nifty was down 23.65 points,or 0.39 per cent,to 6,089.05. The SX40 index on the MCX Stock Exchange ended at 12,228.55,down 41.2 points. HDFC Bank fell 2.37 per cent even as the company reported a 27 per cent jump in Q2 profit to Rs 1,982.3 crore. Reliance Industries was down 0.41 per cent. It posted a 1.5 per cent increase in profit and became the first Indian company to achieve quarterly sales exceeding Rs 1 lakh crore. Overseas investors bought shares worth a net Rs 730.29 crore,according to provisional data from the stock exchanges. Asian stocks ended mostly higher on optimism a deal would be reached in the US to avoid a breach of the debt limit this week. Key indices in South Korea,Japan,Hong Kong and Taiwan rose,while China’s Shanghai Composite fell. European markets also traded higher,with indices in France,Germany and UK moving up. In the domestic market,17 Sensex shares ended lower,led by Hero MotoCorp (-2.44 pc),HDFC Bank (-2.37 pc),State Bank of India (-2.09 pc),Tata Power (-2.04 pc) and ICICI Bank (-1.98 pc). Gainers on the index included Tata Steel (2.82 pc),Bharti Airtel (1.92 pc),Wipro (1.9 pc),Hindalco (1.45 pc) and Hindustan Unilever (0.83 pc). Among the sectoral indices,S&P BSE Bankex tumbled 2.59 per cent,followed by S&P BSE Realty (-1.6 pc),S&P BSE Consumer Durables (-1.2 pc),S&P BSE PSU (-0.95 pc) and S&P BSE Capital Goods (-0.75 pc). However,S&P BSE Metal firmed up 0.91 pc,followed by S&P BSE IT 0.61 pc and S&P BSE Teck 0.59 pc. The market breadth turned negative as 1,467 shares ended with losses,958 shares closed with gains and 137 ruled steady. Total turnover at the BSE was higher at Rs 1,902.47 crore from Rs 1,676.30 crore yesterday. The BSE and the NSE will be closed tomorrow on account of Bakri Id. (Reuters) BSE Sensex fell today,retreating from a nearly three-year high hit earlier in the session,as blue chips declined ahead of the October 17 deadline to lift the US debt ceiling – HDFC Bank,ICICI Bank plunge. Lenders also led decliners after data showing accelerating inflation sparked concerns the central bank would raise interest rates this month. HDFC Bank provisionally fell 2.9 percent after posting slowest quarterly profit growth in a decade,while ICICI Bank ended 2.4 percent lower. The benchmark BSE Sensex provisionally fell 0.43 percent after earlier hitting its highest intraday level since November 2010,while broader NSE Nifty ended down 0.54 percent,snapping its five day winning streak. Indian markets are closed on Wednesday for a public holiday.